On arriving at NATO headquarters in Brussels on Wednesday, President Trumpwasted no time in going after Germany with one of the most pointed public criticisms of an ally ever heard in the annals of the Western alliance, stunning both European and American observers. “Germany, as far as I’m concerned, is captive to Russia because it’s getting so much of its energy from Russia,” Trump told NATO Secretary General Jens Stoltenberg in a blistering on-camera exchange that reportedly left the head of the alliance sputtering. “We have to talk about the billions and billions of dollars that’s being paid to the country we’re supposed to be protecting you against,” Trump added. In focusing on Germany’s energy dependence on Russia, Trump zeroed in on another in a long list of irritants in his relations with Chancellor Angela Merkel. 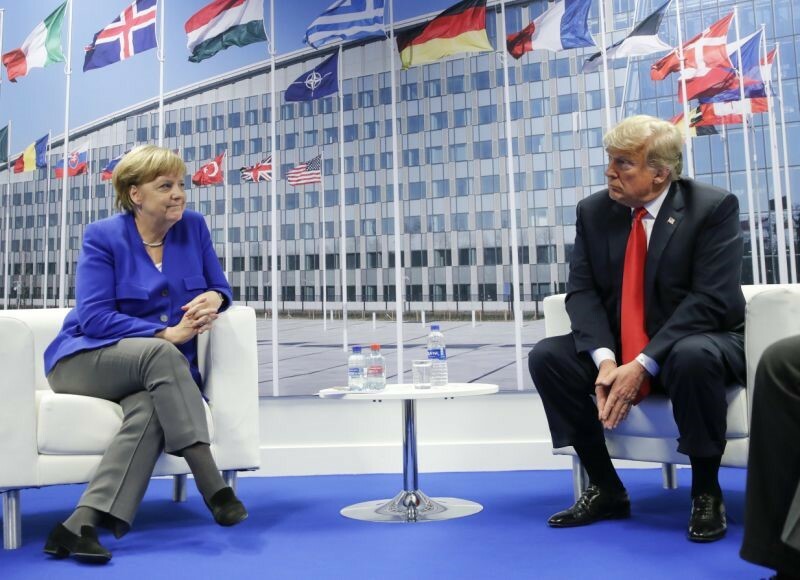 Because of its trade surplus, unwillingness to meet NATO’s goal of spending at least 2 percent of gross domestic product on defense, and liberal immigration policies, Germany has been a particular focus of Trump’s ire. Last month, when Merkel faced defections from her own party on immigration that threatened to bring her government down, Trump seemed to cheer her demise in a tweet that also falsely claimed a spike in German crime. 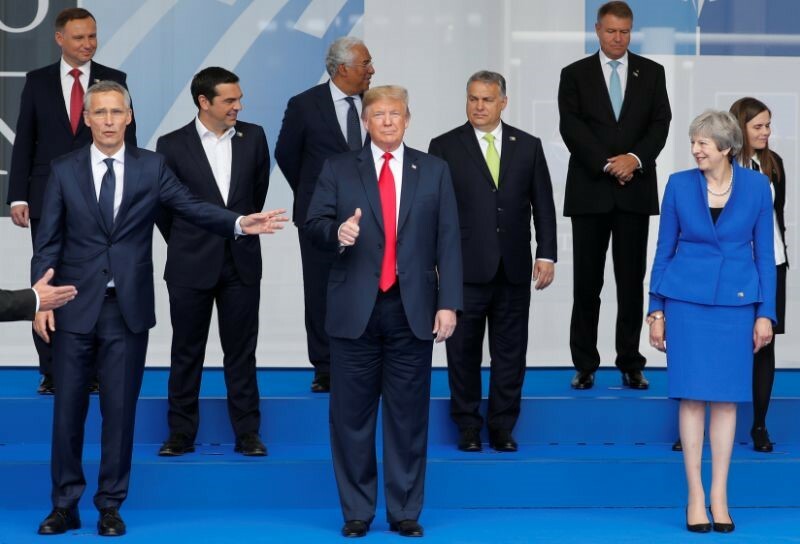 Combined with his blistering criticism of unequal NATO burden-sharing and his burgeoning trade war with the European Union, Trump’s ad hominem attacks on allied leaders at a time when many of their governments are threatened by an ascendant wave of hyper-nationalist, anti-European Union political parties have sown unprecedented distrust in the transatlantic relationship. And all this comes just days ahead of his scheduled July 16 summit in Helsinki with Russian President Vladimir Putin, a man for whom Trump seems to have nothing but praise. Nicholas Burns, a former U.S. ambassador to NATO and currently the faculty chair of the Project on Europe and the Transatlantic Relationship at Harvard’s Kennedy School of Government, was left aghast by Trump’s performance on Wednesday. “Watching today’s NATO meeting was Orwellian, because Merkel has been a thousand times tougher on Putin than President Trump, but that kind of deflection of charges levied at him is right out of Trump’s playbook. He also continues to consistently tell the American people that NATO allies are bad, and that Putin is OK, which also turns truth on its head,” Burns said in an interview with Yahoo News. Having just returned to the U.S. from meetings with European officials, Burns warns that Trump has opened the most dangerous breach in the transatlantic alliance in its seven-decade history. “We have had sharp disagreements on specific issues in the past, but there has never before been any doubt that both sides were committed to the alliance and to democratic values,” said Burns. “What really leapt out at me in my discussions with European officials is their belief that Trump no longer supports a democratic future for Europe, but rather embraces these right-wing, pro-Russian populist movements. He has thus reversed American policy by consistently picking fights with democratic allies, while cozying up to autocrats like Putin, [Chinese President] Xi Jinping, and [North Korean leader] Kim Jong Un,” Burns said. Trump previewed his strategy on Tuesday for what his supporters see as a much-needed course correction for American diplomacy even before he left for Belgium, when he spoke to reporters on the South Lawn of the White House. At a rally last week in Montana, Trump branded the EU “as bad as NAFTA,” adding that “sometimes our worst enemies are our so-called friends.” The disruption Trump will leave in his wake in Europe will almost certainly be followed by a lot of back-slapping and hand-shaking photo ops in Helsinki with Putin. “Trump saying his meetings with our closest allies would be difficult while his summit with Putin will be ‘easy’ actually tells you a lot about his worldview,” Ivo Daalder, a former U.S. ambassador to NATO, told Yahoo News. No NATO or EU allies interfered in U.S. elections or invaded their neighbors and annexed their territory by military force as Russia did in Ukraine, he notes, nor have they bombed civilians in Syria and empowered a tyrant there who uses chemical weapons against his own people, as Russia has. 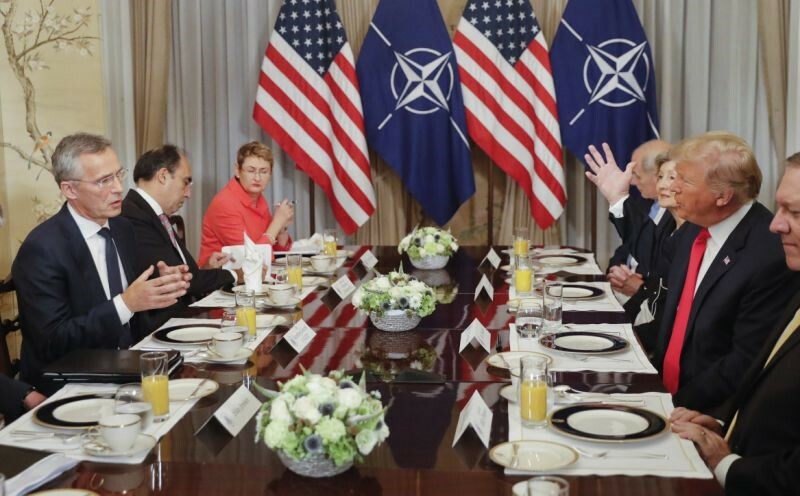 Trump’s decision on Wednesday to sign on to NATO defense plans for shoring up the alliance’s deterrent posture avoided a catastrophic split in the alliance at this week’s summit. However, his call for doubling the goal of alliance defense spending from 2 percent to 4 percent of GDP — despite the fact that many allies are already struggling to reach the more modest target — was rejected and widely viewed as grandstanding. Allies also remain deeply worried that Trump’s meeting next week with Putin will follow a script similar to Trump’s recent Singapore summit with Kim Jong Un. After receiving only vague promises to “denuclearize” on an unspecified timeline in a one-on-one meeting with the North Korean dictator, Trump surprised South Korean allies and the Pentagon by publicly promising to freeze “provocative” joint military exercises scheduled between the U.S. and South Korea. A replay in which Trump calls for freezing NATO exercises and rotational deployments in Eastern Europe designed to deter Russian aggression could rock NATO to its core.